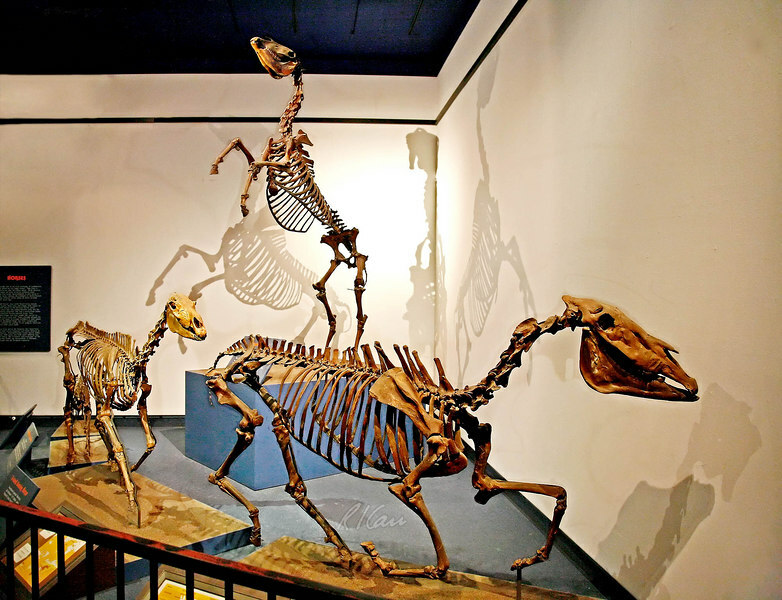 Prehistoric animal skeleton, early American horses: On left is 3-toed Grazing Horse, Neohipparion Leptode, Late Miocene, 6-7 million years ago, from Thousand Creek Formation, Nevado. In foreground is an Early Advanced Horse, Equus simplicidens, from Glenns Ferry Formation, Idaho. On two feet in rear is a Western Horse, Equus "occidentalis" Leidy, Late Pleistocene, 12-40 thousand years ago, from Rancho La Brea, California. Los Angeles Museum of Natural History, January 2006.